The other day while talking to a friend she asked, “What do you think is the most beautiful thing that life can offer? ” And she insisted that I should tell her only one. I was in a fix. Well. What do I say? There isn’t certainly one thing that you can point out. At various stages, life offers many beautiful things that you cherish and relish all along. Some are planned that comes by and some drops in as a pleasant surprise. And, you grin ear to ear thanking your luck and Almighty. I think the most beautiful offering is to be accepted the way you are. In all your glory and in all your imperfection. How beautiful that would be ? I mean, we all long for acceptance. We all crave for that nod of understanding when we can put down ourselves unabashed and unhindered on the table. 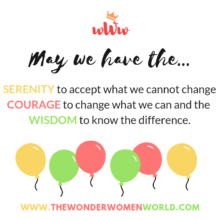 Without worrying – what if ! And, the fact that no matter how insane or ridiculous you are at times. And how practical or impractical you are. How boorish and kiddish you are. 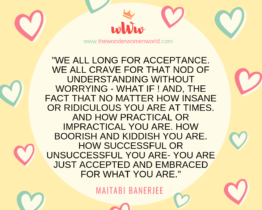 How successful or unsuccessful you are- you are just accepted and embraced for what you are. To me there nothing more beautiful than an unconditional acceptance. Nothing more gratifying than a feel that you are loved for what you are.